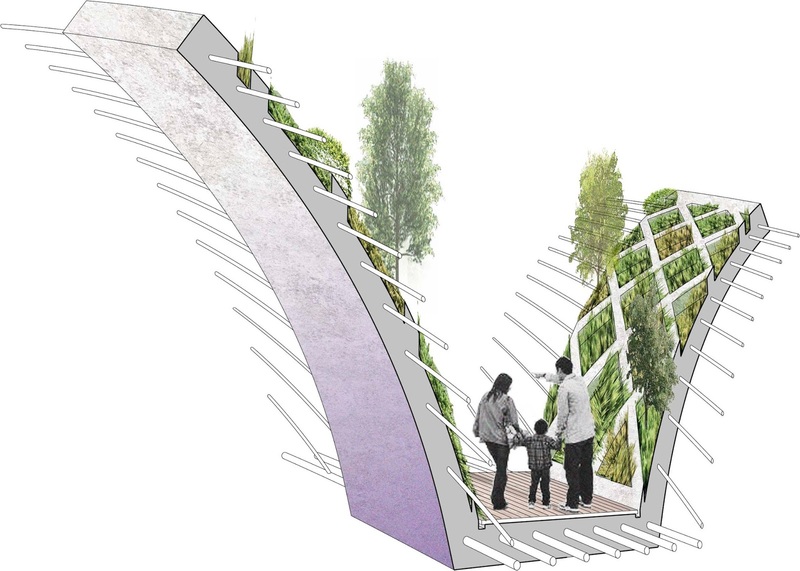 This competition was run by the Glasgow Institute of Architects, Glasgow and Clyde Valley Green Network Partnership and the Central Scotland Green Network. 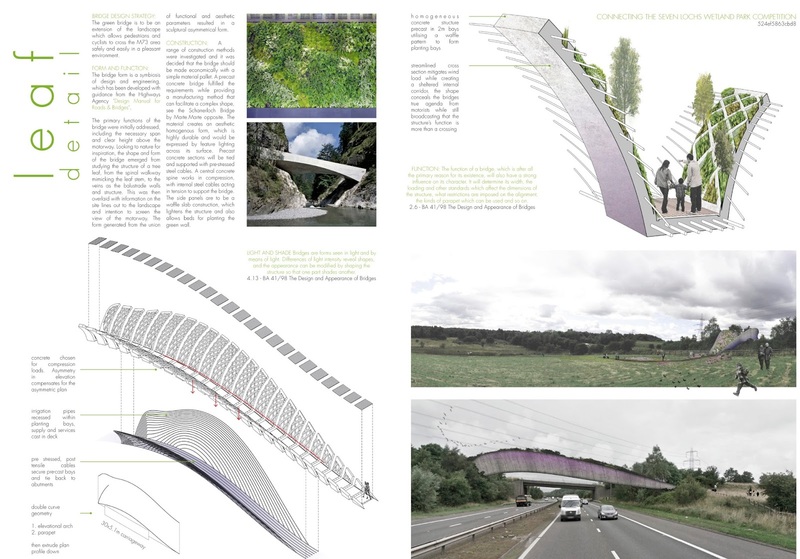 The Brief was to create a 'green' bridging structure connecting the parkland bisected by the M73 Motorway. It's function was to be part bridge, part environmental link and part educational while acting as a sign post for the park's visitor centre. 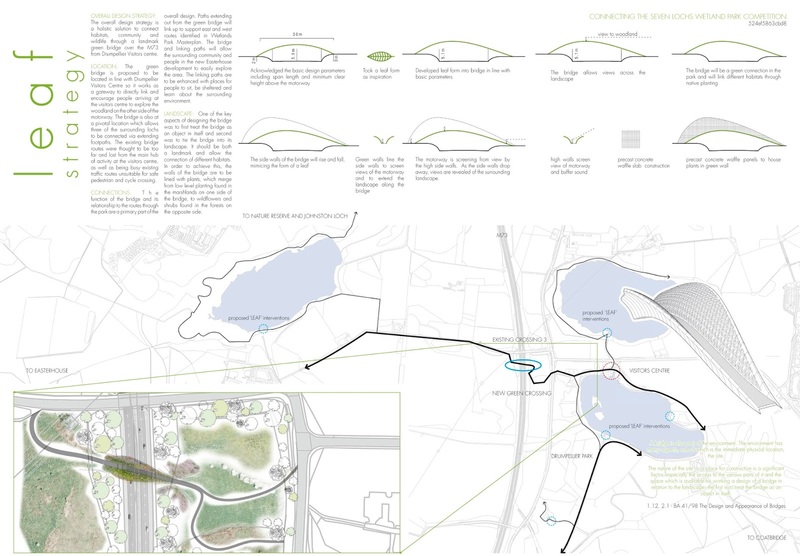 The overall design strategy is a holistic solution to connect habitats, community and wildlife through a landmark green bridge over the M73 from Drumpellier Visitors centre. The green bridge is proposed to be located in line with Drumpellier Visitors Centre so it works as a gateway to directly link and encourage people arriving at the visitors centre to explore the woodland on the other side of the motorway. The bridge is also at a pivotal location which allows three of the surrounding lochs to be connected via extending footpaths. The existing bridge routes were thought to be too far and lost from the main hub of activity at the vistors centre, as well as being busy existing traffic routes unsuitable for safe pedestrian and cycle crossing. The function of the bridge and its relationship to the routes through the park are a primary part of the overall design. Paths extending out from the green bridge will link up to support east and west routes identified in Wetlands Park Masterplan. The bridge and linking paths will allow the surrounding community and people in the new Easterhouse development to easily explore the area. The linking paths are to be enhanced with places for people to sit, be sheltered and learn about the surrounding environment. The green bridge is to be an extension of the landscape which allows pedestrians and cyclists to cross the M73 area safely and easily in a pleasant environment. The bridge form is a symbiosis of design and engineering, which has been developed with guidance from the Highways Agency ‘Design Manual for Roads & Bridges’. 1.11 A bridge is an entity, a thing in itself. It should be a unity in which structure, construction, materials, appearance, use and everything else come together; a unity in which all its parts relate to the whole and to each other. The primary functions of the bridge were initially addressed, including the necessary span and clear height above the motorway. Looking to nature for inspiration, the shape and form of the bridge emerged from studying the structure of a tree leaf, from the spinal walkway mimicking the leaf stem, to the veins as the balustrade walls and structure. This was then overlaid with information on the site lines out to the landscape and intention to screen the view of the motorway. 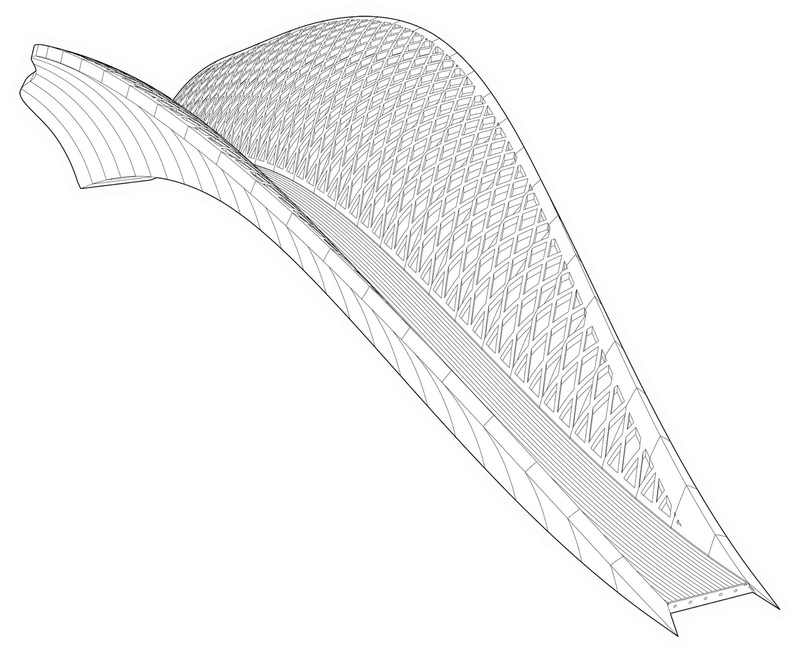 The form generated from the union of functional and aesthetic parameters resulted in a sculptural asymmetrical form. One of the key aspects of designing the bridge was to first treat the bridge as an object in itself and second was to tie the bridge into its landscape. It should be both a landmark and allow the connection of different habitats. In order to achieve this, the walls of the bridge are to be lined with plants, which merge from low level planting found in the marshlands on one side of the bridge, to wild flowers and shrubs found in the forests on the opposite side. Construction: A range of construction methods were investigated and it was decided that the bridge should be made economically with a simple material pallet. A pre-cast concrete bridge fulfilled these requirements and the material creates an aesthetic homogeneous form which reflects the light from its surface. Pre-cast concrete sections will be tied and supported with pre-stressed steel cables. A central concrete spine works in compression, with internal steel cables acting in tension to support the bridge. The side panels are to be a waffle slab construction, which lightens the structure and also allows beds for planting the green wall.